The Lightroom export window is often a source of confusion for photographers. There are so many options and different ways to do things that it can be overwhelming. 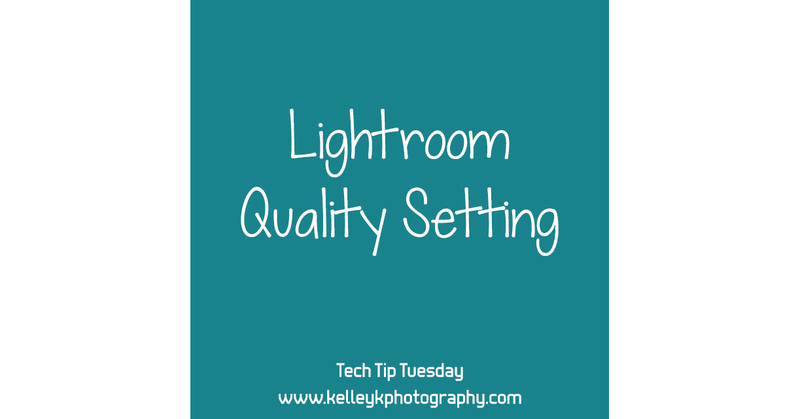 If you’ve ever wondered what you should be using for the Lightroom quality setting, I thought I’d explain what this setting does. The Lightroom quality setting has come up in a couple of my other tips, so this post goes into a little more detail on the subject. Adobe uses the term quality in Lightroom and Photoshop, and I find it to be somewhat of a misleading term. A lot of people use the max (100 in Lightroom, 12 in Photoshop) The quality setting controls one, and only one, thing in both programs. It controls the amount of JPEG compression in the image. JPEG compression is how JPEG images can be optimized to reduce file size. Using the maximum quality setting (100 in LR) may seem like a great idea, but it results in images that are unnecessarily large because they aren’t optimized to reduce extraneous data. Large file sizes result in wasted disk space and slow transfer speeds (both uploading and downloading). Wasted space means your images will fill up hard drives, USB thumb drives, backup drives, cloud storage, and web servers unnecessarily. Slow upload speeds affect things like uploading your images to web sites, proofing galleries, cloud storage, etc. Slow download speeds means it takes longer for clients to download their galleries and it takes longer for web pages to load. While having the highest “quality” sounds great, it’s also important to optimize your images for reduced file sizes and faster transfer speeds. While Lightroom uses a quality scale from 0-100, Photoshop uses a scale from 1-12 when saving an image as a JPEG. People have done extensive research into quality settings in Lightroom and Photoshop to see how they compare. I won’t go into the details, because you read about it elsewhere if you’re curious, but both programs use the exact same compression algorithms. While Lightroom appears to use a scale from 0-100, it actually only has 13 different levels of compression that it applies, that match up perfectly to Photoshop quality levels as shown in the table below. For each range of Lightroom quality settings, you can use any number in that range and get the exact same results. I like to assign a nice round number to each of the ranges to keep them straight in my head, so I included that in the table below as well. But you don’t have to use my round numbers. For example, I use and highly recommend quality 80 in Lightroom (as highlighted on the table below). If you would rather use 77 or 84, you’d get the exact same results as using 80. It makes no difference. When I was still relatively new to Lightroom, I did some research on quality settings and when I found that quality 80 was equal to quality 10 in Photoshop, I made the decision to start using quality 80. Why? In Photoshop, Adobe made quality 10 the default setting. I don’t know why they used a different scale in Lightroom, or didn’t use a default of 80 at least in Lightroom, but they didn’t. The way I see it, with the 0-12 scale in Photoshop, 10 is the baseline for minimal compression and maximum quality, and 11 or 12 for if you need to go above and beyond that. Quality 10 (in PS) or 80 (in LR) provides good balance between file size and actual image quality. Using quality 80 reduces file size significantly – file sizes are 1/4 to 1/2 the size of images exported at quality 100. Yet if you look at the images close up, there is no visual difference in most cases, even when zoomed 1:1 on high-resolution images. This saves a tremendous amount of disk space as well as shortens upload/download time. When you save at quality 100, your images are bloated with unnecessary data. Reducing file size also has benefits on the web. Images with large file sizes are often re-compressed on social media and other web sites. By reducing the file size before uploading, you can often avoid your images being heavily compressed after upload, so they look better in the end. When I first made the switch to quality 80, I looked at a bunch of examples online, but then I started exporting some of my own images at various quality settings and looking at the file sizes and the visual quality. I considered posting examples of images at different quality settings, but I think the best way to see for yourself on your own images so that you can try various images and zoom in 1:1. If you do want to see some image examples from others, Jeffrey Freidl shows a bunch of great examples on his blog here. While I use quality 80 for most purposes, it’s not always appropriate to use a single quality for every image. There are a few main reasons why I use other settings. Some web sites or other purposes require you to upload images that are under a certain file size. In this case, it’s easiest to use the “Limit File Size To” option. This disables the quality setting, because Lightroom will use the quality setting necessary to ensure each exported image is under the specified file size limit. Lightroom can use a very low quality setting to get a file under the limit though if the image dimensions are too large, so be sure to resize images appropriately and check your exported images to make sure they look acceptable. The only time I use a quality setting higher than 80 is if I am exporting a specific image for a large print or canvas. When I do this, I export for the physical size of the print and use quality 90 to ensure there are no compression artifacts in a large print. I haven’t had any reason to believe it’s necessary to do this, but when I’m exporting a single image for large wall art, I’m not concerned about file sizes or upload speeds. I still don’t use quality 100, because I find it excessive. I would also use quality 90 if I ever noticed compression artifacts in an image exported at quality 80, but honestly this has not happened. This is something I rarely do, but there have been occasions when the upload speed is the most important thing, for example if I have a large number of images that I want to share quickly online. For example, sharing a gallery of personal images with family, or a large proofing gallery. This is really just about speed, not visual perfection, so only use lower quality settings if the potential for some evidence of compression is okay. If you have been using quality 100, these Lightroom recommendations can save you time and disk space. If you have any need more help with Lightroom, please share your questions below or contact me about Lightroom mentoring if you need more personal assistance.